working and abandoned cranberry bogs. The main entrance and parking lot are on East St. 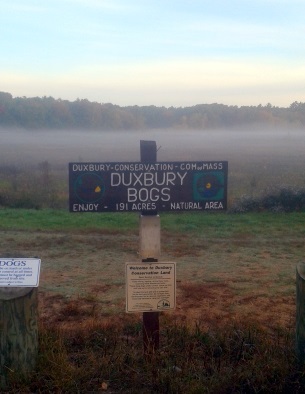 While this location makes it a bit tucked away in a quiet area of Duxbury, it is easily seen from route 3. 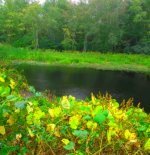 The main trails crisscross around and through the bogs, while the Bay Circuit Trail runs through and then to the side of an Esker that divides the bogs with another smaller pond. On the eastern side of the bogs is a pond called Golden Reservoir, simply called Sunken Forest on many maps. The many tree stumps from an ancient forest emerge eerily from the pond creating another highlight of hiking trails through the area. While there are many different possibilities for hiking this area, I will describe a 2 mile route that touches most of the features of this property. Parking in the lot on East St, I headed on the sandy dirt road leading straight down into the bogs. The hiking trail loops here in front of the parking area and one can easily go to the right, but I always seem to take to the left. Like many other properties I have visited, my first impression of the Duxbury Bogs was that it is a loop trail around a single bog. Once on the property, it soon becomes obvious that it is much larger. 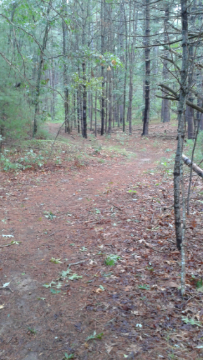 As soon as a tenth of a mile, one of the trail loops enters from the right. The trail becomes a bit rocky and rough after this first intersection. Then at 1/3 mile another intersection with another loop around a bog to the left noted as Old Bog on the map. The hiking trail taking a hard left. A more soft left leads you on the Bay Circuit Trail portion in the bogs. I take the hard left which becomes a grassy roadway with a narrow dirt track in the middle. Soon it leads to all grass as it winds its way around this side bog. 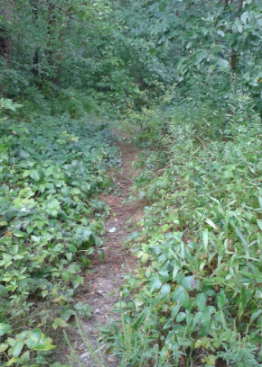 there are many narrow wooded paths leading off to the left. I did not explore any. of any of the eskers on the property. 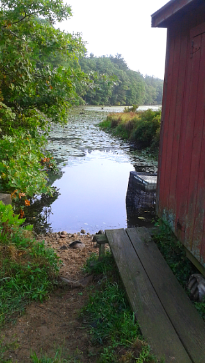 View at the side of the pump house at the Old Bog of Cranberry Factory Pond. Continuing on, as the trail curves to the right I disturb a blue heron, of which there are several types of heron residing here in the Bogs. The trail soon comes to a small pump house and goes to the right, but I go left to explore part of the BCT. At 3/4 miles the trail starts as a road and turns grassy and narrow. 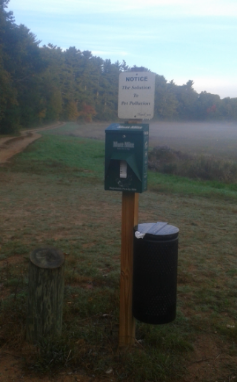 The hiking trail route now follows a portion of the Bay Circuit Trail through Duxbury Bogs. narrow track and enters the forest. To the right the land runs uphill. It is here that the trail lines the esker. and run along Cranberry Factory Pond to the left. 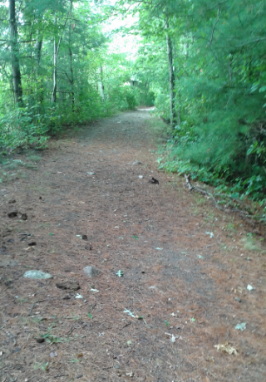 The trail narrows and leads beside Cranberry Factory Pond below an Esker. 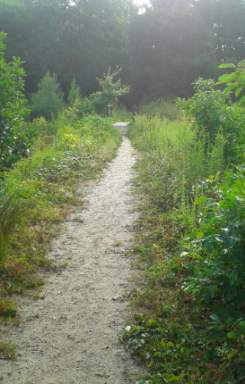 At about one mile a side path will lead out to the pond. There are a couple of trails up the esker that I did not explore. One steep and straight up, another climbed in a more gentle switch back motion. 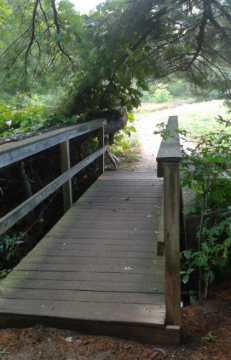 Soon after the trail narrows again and crosses the stream that feeds the pond by a boardwalk. 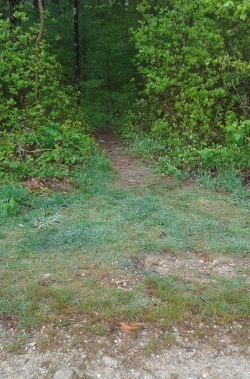 There is a trail that leads to the right and the BCT goes left here. The very narrow hiking trail! a wet area that has an alternate board walk for wet weather. 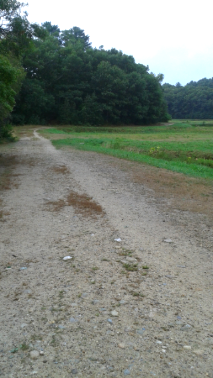 The trail narrows once again becomes grassy and leads out to Mayflower Rd. 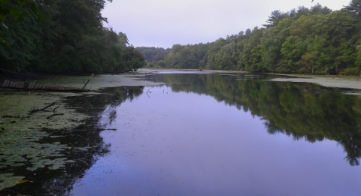 Along the way here, are the best views of Cranberry Factory Pond! The BCT continues left down Mayflower Rd. I turn right, for a circuit trail back into the bogs. 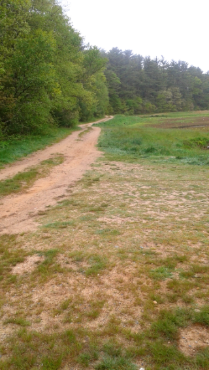 At approximately 1.15 I return to the bog road. Along the way another older bog is to the left on Mayflower Rd. 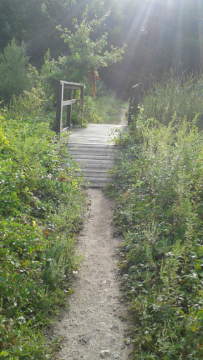 Following the first bog road I come to, follow straight til a narrow path that leads to the left. If time or effort is short, leading straight I bring you directly back to the parking area. Leading left will bring you through the meadow like part of the bogs. Grassy, overgrown and filled with wildlife, it is my favorite part of the hike. 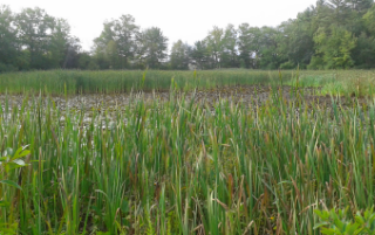 To the right is an area that looks like a wetland when I visit. On the map it refers to a pond here. My visits here are during the drought time of summer 2016.
on the other side of this older bog. On the other side at 1.40 take a right leading into a bit of forest that will soon run along Golden Reservior which contains the sunken forest. Many sunken forests in the New England area are found off the ocean shores. Here on the south shore it was estimated that the shoreline extended 75 miles further into the ocean than where our current shoreline exists. All sunken forests are formed when a glacier in the area, thousands of years ago melted and caused water levels to go up. 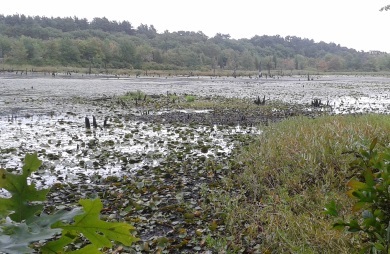 Many areas of forested lands became submerged and the mud that encapsulated the forest also preserved it. 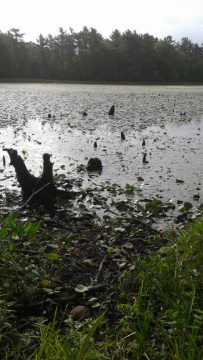 Many times the stumps left in the sunken forests are thousands of years old. 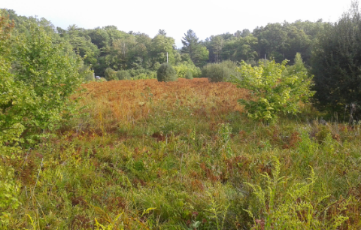 The formation of Eskers in the Duxbury Bogs help prove of evidence of glacial activity here. If you do not know what an Esker is my page of Great Esker Park in Weymouth will explain. 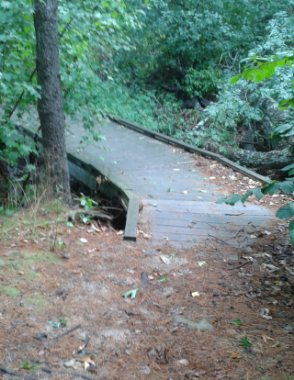 The trail is once again wide and road like and leads alongside the Sunken Forest. Many views of this phenomenon emerge here. 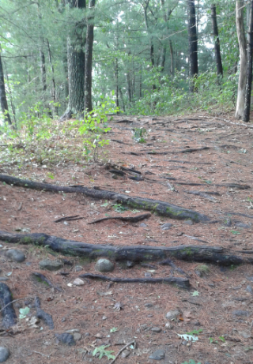 bit of wooded land climbing uphill. one of the bogs once again. Now the hiking trail is a wide open gravel route with scenic openings to the sunken forest and views of route 3 beyond. At 1.85 there is a bog cross path to the right. and the trail takes a curve to the right. just before the two mile mark. The last bit of trail to the parking area makes it to the two mile mark. From exit 10 on route 3 head west (right) on Tremont St Rt 3A toward Kingston. At the lights turn right on route 53. Follow to a small rotary and take the first right on Winter St.Take a left on Summer St and the first right on East St.The parking area will be on the left before the route 3 overpass. From Exit 11, take a left on Congress St (route 14). Take the next left on Chandler St. Approx.1/2 mile on left is Mayflower St. The other end of the bogs are here. 7-10 vehicles at East St parking. 4 vehicles at the Mayflower St end. Moderate: 2 mile guide described but loads of other possible routes. 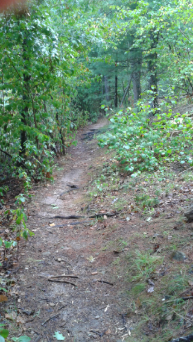 Easy: Mostly flat only hill on main trails is after sunken forest. Other more strenuous side trails exist leading up the eskers, but are optional.